In their first appearance, Bashundhara Kings reached the final of the 13-team Walton Independence Cup Football Tournament‘2018 eliminating holders Dhaka Abahani Limited by 7-6 goals in sudden death session of the tie-breaker at the Bangabandhu National Stadium on Thursday. The crucial 2nd semifinal match between the two national star-studded teams was locked in 1-1 goal in the stipulated 90 minutes and also in the extra session of 30 minutes. New sensation Bashundhara Kings will play the final on Wednesday (Dec 26) at 4:30pm against Sheikh Russel KC, which made the final berth eliminating Brothers Union Club by 2-0 goals in the first semifinal on Wednesday. With day’s feat, Bashundhara Kings not only reached the final of a country’s major soccer tournament for the 2nd time after the Federation Cup Football, but also took revenge of their 1-3 goals defeat against Dhaka Abahani Limited in the Federation Cup final last month. 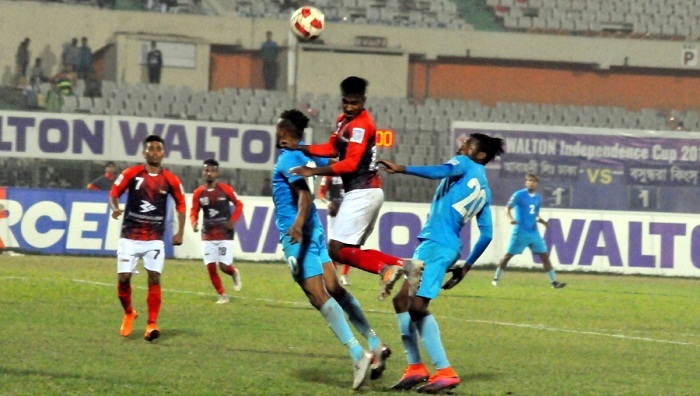 In the match, Motin Miah put Kings ahead in the 69th minute (1-0) while Haitian forward Kervens Belfort restored the parity for Dhaka Abahani Limited in the 82nd minute (1-1). After the first five shots in tie-breaker, the match was again locked in 4-4 (5-5) to force the match towards the sudden death session. In the tie-breaker, Haitian forward of Abahani Belfort and World Cup playing Costa Rica booter Daniel Colindres of Bashundhara spoiled the spot kicks. Finally, Kings national coloured custodian Anisur Rahman Zico emerged as the match hero as he scored the match-winner for the Kings after foiling the last attempt of Abahani’s substitute medio Imtiaz Sultan Zitu. Later, Zico was adjudged man of the match. Earlier, holders Dhaka Abahani Limited moved into the semifinals of the Independence Cup Football Tournament eliminating Saif Sporting Club by a solitary goal in the 3rd quarterfinal on December 13. Newcomers and big-budgeted Bashundhara Kings made a semifinal berth beating Rahmatganj MFS by 3-2 goals in tie-breaker in the 4th quarterfinal after two teams finished with 2-2 goals in the schedule time. They advanced to quarterfinals as Group D champions securing four points from two encounters.